You might have heard of Aztec tattoos from your friends and from online tattoo sites. What exactly is an Aztec tattoo? 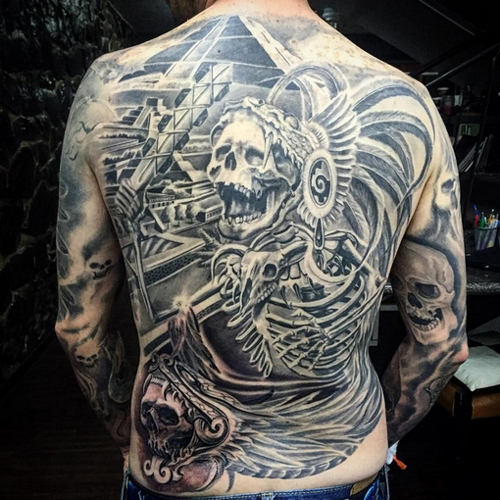 It is actually one of the most popular sub categories for tattoo designs. Before you decide to get one though, you should check out some important points about the Aztecs and their tattoos. An Aztec tattoo is a sub-category by itself. We normally associate them with their magnificent architectural designs, complex culture, religiosity and unique artistic style. The art of tattooing in particular has great interest in modern times because of their intricate and deeply symbolic patterns. People can have different reasons for getting this kind of tattoo design. Aztec tattoos have a resounding cultural flavor to it. A person may therefore wish to have a tattoo design that has Aztec origins for racial or cultural reasons. Those who have Aztec blood may want to preserve and retain their sense of connection to their ancestors. There are also quite a few people who are simply very interested in the Aztec culture. 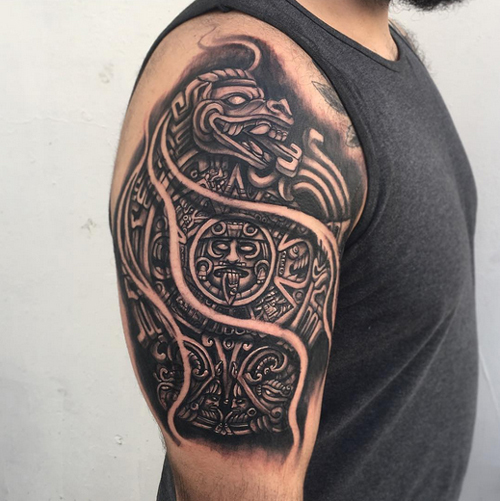 For them having a tattoo is a way of paying tribute to the great Aztec culture. There are also some people who appreciate this kind of tattoo for its symbolism. The sun for example is a recurring symbol in Aztec art. Those who have the Aztec sun on them may wish to send out the message of life and strength. Take time in picking out a design. The tattoo that you get should match your preference and intention exactly. Here are some of their possible sources. – If your purpose is to get an authentic design used by Aztec people, consult an expert academician or look through textbooks. You would need to do this if you want to be sure that your tattoo design is not a mere imitation or adaptation. The Aztec calendar for example is a popular design with accurate copies in textbooks and even in online sources. – Quite possibly, tattoo parlors and artists will have their own collection of these designs too. You should be prepared though for the possibility that some of the designs might not be accurate representations.